Honesty is usually the best policy, but when bad things happen to others, children need comforting. Sometimes that means lying. 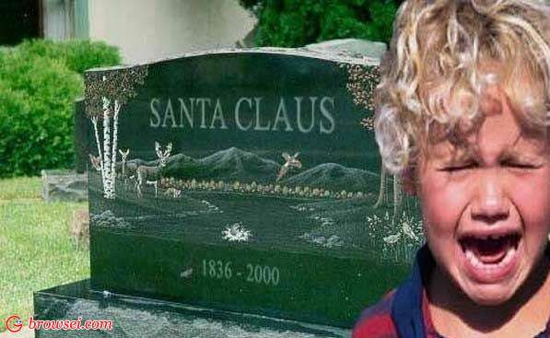 I didn’t cry when Santa Claus died for me,my brothers killed him. I was upset, angry at my mother for lying to me, and feeling stupid. All parents lie. Even when they don’t lie, kids upon reaching adolescents think parents have lied about at least one or two things. I urge honesty. But also think there are times to lie to your children. When bad things happen to others is one and the prospect of your death, another. First about the prospect of bad things happening to your child. When a child becomes aware of news events about bad things, Fred Roger’s mother gave the best advice. Follow this up by teaching your child to be one of the helpers. If you can help another when bad things happen you are strengthened. Build resilience in your child by having him or her help when disaster strikes anywhere in the world. How can vary, but a toddler can help you put stamps on a donation letter, a two-year old can put coins in a charity box or help you pack a care package. Next about your child’s fears about you dying. These start when the child has a pet die or another loved one die. Some children ask directly, others don’t. Use those occasions to say something like, “We all die, but I intend to live a long time so I can dance at your wedding and hold your children in my arms.” The younger the child, the more that will satisfy. When your children are able to read if you are asked about the possibility of your death, say “I work hard to stay healthy, I want to dance at your wedding.” Follow with a question about what is worrying them. When adolescence comes, take the time to talk to your kids about your will, and who would care for them if the worse happens and you die. Living as much as I can right now. Loving you as much as I can right now. Memories keep us all alive. Remember me, and know I always love you. Finally, here are five things you can do to help a child of any age deal with your death. Have a will and as much life insurance as you can afford, particularly if your children are young. Make your own funeral plans. Create a memory book with each child. Write an I love you and am proud of you letter for each age and stage. Include these in the memory book. Write a good-by letter, either one for each child or one for the family. It may seem the above strayed a bit from lying. Reality check, we all deny that bad things will happen to us and our children. We deny that we will at one time or another die. Finally, we are all tempted to keep our children innocent as long as possible. Human nature, and for the most part a way to keep going. But also can turn into a big lie if something bad happens; that could leave a beloved child feeling lied to and betrayed. Making peace with the horrors of life and the fact that bad things like dying are part of life is healthier. Discussing those facts with awareness of age and stage strengthen those hurt or left behind if you die. 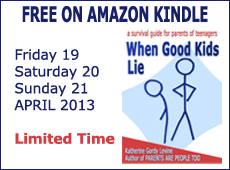 For more specific tips about lying , see yesterdays’ blog or get my When Good Kids Lie. Buy it now or wait to get it free this week end. Help me share my knowledge. If you found this post helpful like, comment, share, or endorse me. If you buy or get one of my eBooks free please review. even a few words helps me. And yes, even a bad review has value. Of course, good reviews are particularly helpful. Here is a link too a post I wrote about how to write reviews. But even a comment on my blog or Facebook pages helps as endorsements. DISCLAIMER ONE: ADVICE IS ADVICE and only works for some parents some of the time. Moreover, what works for one child in a family might not work for another child in the same family. You must experiment to find what works for you and yours. Good luck. DISCLAIMER TWO: FORGIVE MY GRAMMATICAL ERRORS FOR I HAVE DYSGRAPHIA. If you need perfect posts, you will not find them here. Dysgraphia is a not well known learning disability and means that sometimes my sentence structure is not that easy to follow or I make other errors. Still, most people understand me. All of my books are professionally edited, but not all of my blog posts are. If this troubles you, feel free to read elsewhere. If you persevere, you are practicing kindness by lifting my spirits for that means you find what I say helpful and that is one of my missions. Kindness always repays those who spread it. This entry was posted in Parenting Issues and tagged challenging children, honesty, Katherine Gordy Levine, lying about dying, parenting, parenting teenagers, parenting tips, parents, Parents Are People Too, postaday, quotes, teaching honesty, tips on parenting. Bookmark the permalink.